The book opens with the story of a woman in Uganda with AIDS who is unable to access treatment due to lack of money and dies a painful death at the age of 33. Her death, despite drugs being available that could have helped her, begins a discussion of inequalities in healthcare provision. Author Sharifah Sekalala focuses on the millions of people suffering from AIDS, tuberculosis and malaria. This book considers how hard laws, which are binding legal instruments such as the trade-related aspects of intellectual property agreements, have made access to drugs cost-prohibitive for many who need them, particularly in developing countries. Hard law prioritises patent rights. Soft law approaches, which are not normally legally binding, can be easier for counties to adopt and reach agreement on, and are generally more flexible, which the author argues is important in public health pandemics. She argues that lessons can be learned from the approaches taken with malaria and tuberculosis. 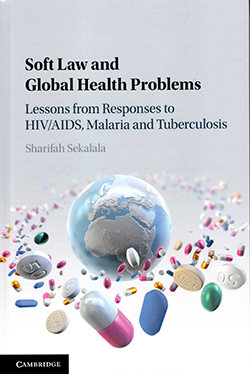 Although clearly in favour of soft law approaches to addressing global health problems, the author gives a detailed description of both approaches. She explores lawmaking on global health and analyses the viability of current global health financing trends within new and traditional organisations such as the United Nations and the World Health Organization. This important book, which draws on a vast number of resources, would be suitable for nurses with a specific interest in international development or studying global health policy.